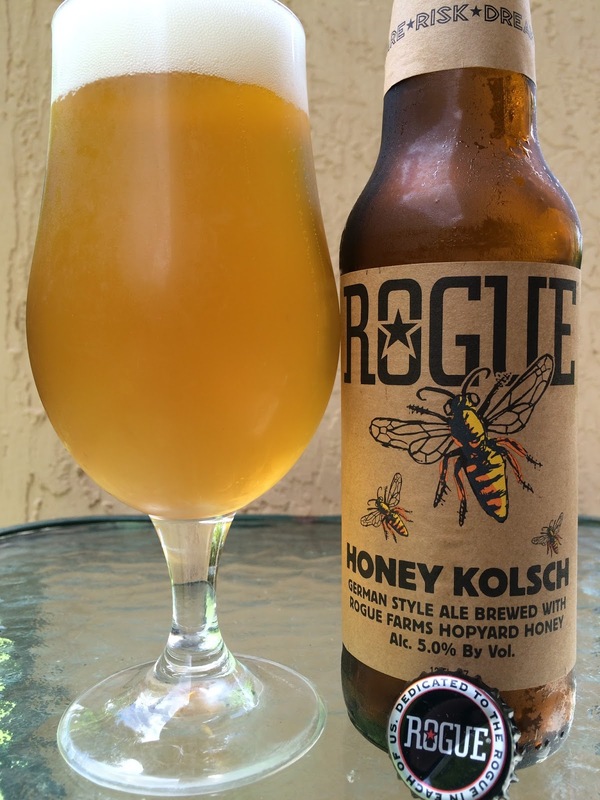 Today I'm checking out Rogue Honey Kolsch brewed with Rogue Farms HopYard Honey. I saw a few pictures online showing this beer bottled in those old ceramic bottles Rogue was known for. And the bottle on this beer's page on their site is a bomber with a clear label. I saw this 12 oz bottle for the first time last night at the liquor store, pretty plain, just showing a few bees on the label. "DARE. RISK. DREAM." appears on the neck label. 5.0% alcohol. Pleasant honey sweet aroma with a floral touch. Tangy and grainy flavors to start. Grassy, lemony, hoppy, nicely sharp with a nice honey addition that is totally noticeable. Crisp meets body, great balance. Nice flavors and bitterness linger in the finish. Wife said "really good" and I concur. Was the winner with three other solid beers we tried today!